Is there a more romantic dinner than pasta? Hold your rebuttal – the answer is no. I mean, just call upon memories of Lady & The Tramp and you know exactly what I’m talking about. On top of that, what’s more elegant than white sauce? THAT’S RIGHT: NADA. So, break out some pasta, chop up some garlic, and pour a glass of white wine—not to drink though, we’re gonna cook with that one and pour out some red wine for actual enjoyment, because it’s Valentine’s season! Not that it means much to us, but if it gives us an excuse to eat more pasta, we’re all in. Easy to make in under 45 minutes! Dear Pasta, I love you. 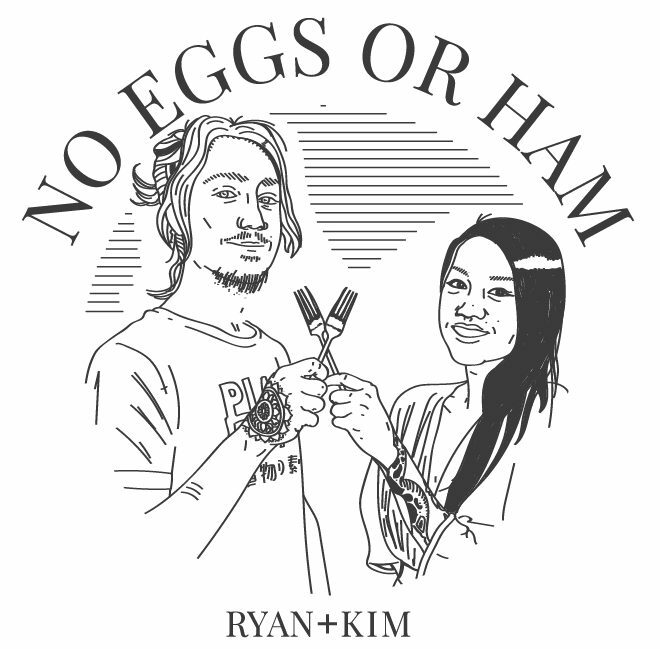 Sincerely, No Eggs or Ham. Creamy alfredo style sauce coats al-dente pasta alongside tender asparagus and grilled mushroom slices. Pasta: Cook fettuccine in a large pot of boiling salted water until it’s al-dente (about 8 minutes). Drain and rinse with cold water. Asparagus: While water heats up, pre-heat oven to 450°. On a cookie sheet lined with parchment paper, toss asparagus with enough olive oil to coat (about 1 1/2 tbsps) and a heavy pinch of smoked salt (about 1/2 tsp). Evenly disperse, top with lemon slices, and roast until tender; about 10 minutes. Sauce: Heat butter & garlic in a large pot over medium heat. Once garlic is lightly browned, add wine and let it reduce by half. While wine reduces, shake or blend together soy milk, flour, and bouillon. Add to wine mixture along with parmesan and cook, stirring occasionally, until sauce begins to bubble. Reduce heat to medium low and cook until it’s thickened; about 5 minutes. Place on lid, turn heat to low, and store until ready to use. Mushrooms: Heat a cast iron grill pan (or medium sauté pan) over medium heat for 5 minutes. In a mixing bowl, toss mushrooms with olive oil to coat (about 2 tbsps) and a heavy pinch of smoked salt (about 3/4 tsps). Cook on both sides until golden brown; about 4 minutes per side. Assembling: Rinse pasta with warm water to loosen, add to sauce, and gently fold to coat. Serve while fresh with asparagus and mushrooms! Store any leftovers in an airtight container for up to three days. Reheat in a pot over medium heat with a splash of soy milk until heated through.